Sardine ( locally known as Mathi or Chaala in Kerala), is one the cheapest and tastiest fish available in South India. Sardines are one of the best sources of omega 3 fatty acids, which reduces your triglycerides and cholesterol. The small bones of Sardine is good resource of calcium. Keralites usually make sardine curry, mathi vattichatu or fry with sardines. Today I will share you the recipes for sardine fry. This is a recipe our driver shared with me. He is from Alappuzha a coastal region in Kerala. Clean the sardines well and make oblique gashes on both sides of the fish. Marinate the mathi fish with this paste and keep it aside for half an hour. Heat a frying pan and pour some oil in it. Add the curry leaves. When the oil gets heated place the sardines over the curry leaves and fry it on medium heat turning them to the other side in between. Switch off and serve immediately with rice. Cleaning sardines takes time and need patience. Use an apron while cleaning sardine and wash your hands with soap multiple times after cleaning sardines because they are having a stinky smell. Frying sardine can make veggies go mad with you because it has an extreme strong smell. Careful when you fry sardines, they have a bad reputation for its stink. Need more fish fry recipes? Dont worry, try these. 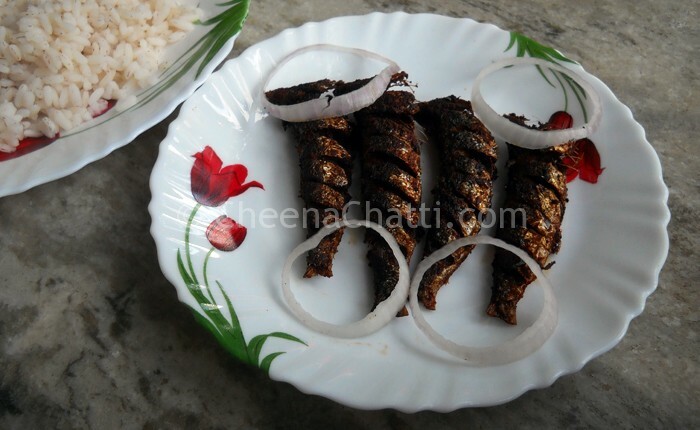 This entry was added on May 10th, 2013 by Cini P Moideen in Non Veg and tagged with fried sardines recipe, fish, kerala sardine fry recipe, sardine fry, sardine fry kerala style, kerala mathi fry, fried sardines, kerala sardine fry, how to fry sardine. Last revised on March 29th, 2018. Mathi etra ondakiyaalum mathiavoola :). Adding garlic and onion will add to the taste . SUPERB.Thankyou. Made it last night with 12 nos for 3 of us.Zoop and gone.Need at least 36 nos maybe more with this recipe to say Ahhhhhhhhhhhhh. Sorry for the late reply @Jay Zaim. Thank you for taking the time to try the recipe and sharing the outcome with us. Hope you will try our other recipes too. I have a confusion.. What ingredients need to be ground? ?